Take a break today with this fantastic collection of solitaire games featuring an original twist. Choose from ten of your favorite solitaire variations including Klondike, Tri-Peaks, Pyramid, Spider and more. 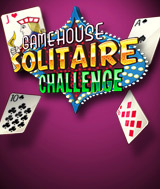 Whether you´re looking to relax with a soothing game of cards, face a perplexing challenge, or go for global bragging rights, GameHouse Solitaire Challenge is a unique take on classic family fun. Comments: I love this game. It has many different types of solitaire games to play. Fun for everyone.